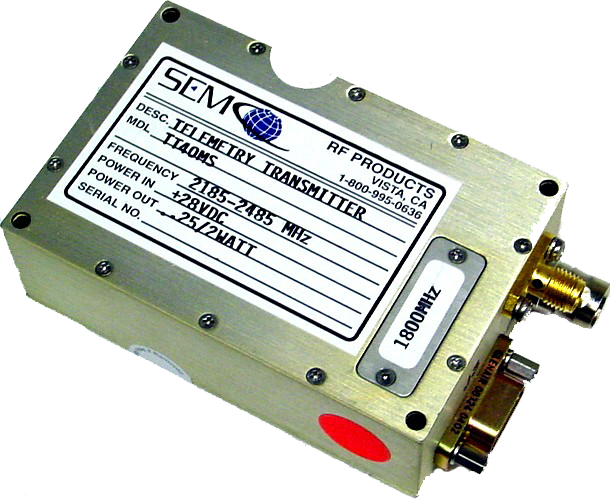 The TT40 series of airborne dual power (.25/2 W) telemetry transmitters are designed to transmit data in the frequency bands covering 1435-1540, 1710-1850, or 2185-2485 MHz. These transmitters are true FM, modular, all solid state and are protected for operation into any VSWR, without damage, including open or short circuit. Rugged construction, minimum size and light weight make these transmitters ideally suited for airborne applications and where operation in harsh conditions is required. Multiple frequency operation is achieved by utilization of a frequency synthesizer. Transmitters may be ordered as fixed frequency or any number of channels in a given band, spaced in 0.5 MHz increments.